Intelvision was established in the Seychelles in October 2004. An innovative company, Intelvision was only the third telecoms operator in the region at the time of launch. Beginning with a staff of just twenty and the aim of providing affordable cable television, broadband internet and telephone to everyone, the company has gone from strength to strength. Founder Mukesh Valabhji stated in a recent interview that while in the first year of operations Intelvision connected five hundred homes, today the penetration rate stands at 70% for television services – among the highest in any of the sub-Saharan regions. This year marks the company’s tenth in business there are close to one hundred and twenty workers employed at Intelvision, including half of the original team which stands testament to the sense of family and togetherness which has been part of the Intelvision objective since day one. A business profile of Mukesh Valabhji explores the entrepreneur’s many other business interests as well as Intelvision. Here, Mukesh expands on the Intelvision concept and discusses the continued aims and objectives of the company as it celebrates ten successful years in business. Mukesh has stated that he is exceptionally pleased with the achievements of Intelvision to date. A decade in, Intelvision can connect as many as 90% of the homes on the main Seychelles island of Mahe and 50% on Praslin. 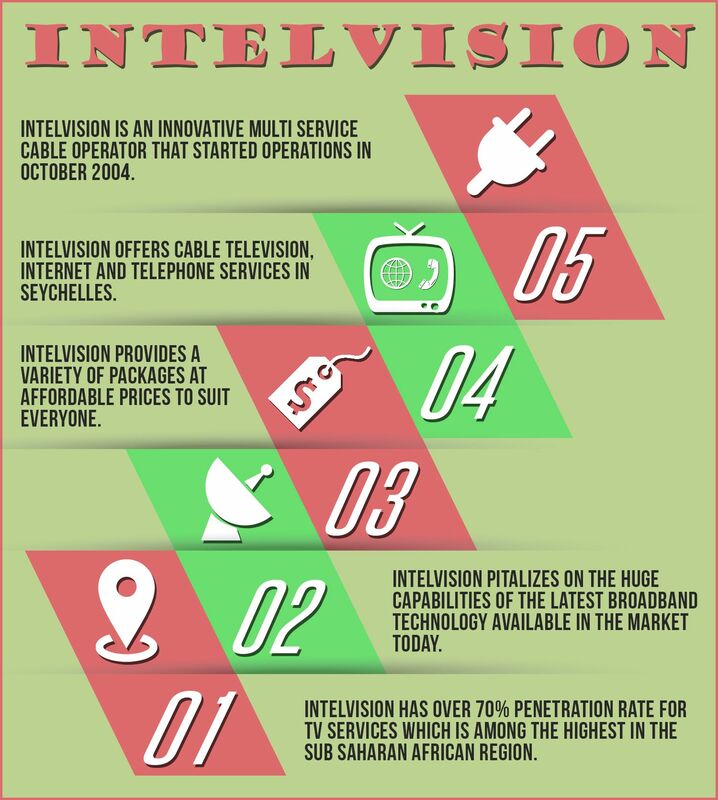 One of the main objectives of Intelvision is to make their products and services available to everyone through the provision of affordable packages, competing with Cable and Wireless which had a monopoly in Seychelles until the establishment of Intelvision. Not only does the cost of making a telephone call undercut the competition but Intelvision have been prepared to connect homes which other companies considered unprofitable to do so. Intelvision offers three voice packages and requires only the purchase of a telephone and modem at affordable prices to get connected. Intelvision has also been granted permission to begin operating a 3G and 4G mobile network which should be rolled out soon. Intelvision offers a range of options for broadband internet packages including high speed connections and the option to connect up to three computers on a home network. A voice connection is not required for internet and the relevant software and external equipment such as modem and Ethernet and USB cables are all included in the package. One of the biggest accomplishments of Intelvision over the years, says Mukesh, has been making fast, affordable internet accessible to everyone. By offering packages to suit every budget Intelvision open up the gateway to knowledge to even the poorer families, creating the potential for a brighter future. There are currently more than one hundred cable television channels provided by Intelvision, divided into six separate bouquets to suit every budget. Intelvision are the only cable provider in the Seychelles to offer SBC as standard even in the budget packages, enabling far more people than ever before to access the popular channel without having to pay for many additional channels which may not be required. As with the telephone lines and the broadband internet, Intelvision and Mukeshaim to provide a variety of packages making the services available to everyone, including the average to low income families in the Seychelles. One of the biggest challenges Intelvision faces is maintaining the high quality standards customers have come to expect, as even those subscribers to the cheaper packages require the same levels of customer service. For this reason, Intelvision invests heavily in human resources and in the latest technology in order to provide a top quality service which caters to all, from those subscribing to the luxury packages right through to those on a budget taking out only the cheapest packages. As a company, Intelvision aims not only to be profitable, but also to provide a valuable service which can be accessed by as many people as possible. Founder of Intelvision is Mukesh Valabhji, a Seychellois entrepreneur with a number of business interests in media and telecommunications, hospitality, trading and resorts and commercial retail property. Mukesh operates mainly within the Seychelles, Dubai and Singapore regions. He is founder and manager of Capital Management Group, which has many vast business interests. Prior to this, Mukesh spearheaded the Seychelles Marketing Board for over twenty years, which was successful enough to be able to boast single-handedly bringing in as much as 20% of the Seychelles GDP at times. He also acted as Economic Advisor to the President of the Seychelles for a three year period and held the prestigious position of Chairman of the Public Utilities Corporation for a decade. Intelvision is one of the main business interests currently held by Mukesh. Also in the pipeline is an all-new luxury resort which is currently being built on a private island within the Seychelles which will open next year offering sumptuous accommodation and exquisite spa treatments in stunning natural surroundings.